More generally, the surfaces of planetary bodies can be mapped even if they are too irregular to be modeled well with a sphere or ellipsoid; see below. Even more generally, projections are a subject of several pure mathematical fields, including differential geometry, projective geometry, and manifolds. However, "map projection" refers specifically to a cartographic projection. 7 Which projection is best? Maps can be more useful than globes in many situations: they are more compact and easier to store; they readily accommodate an enormous range of scales; they are viewed easily on computer displays; they can facilitate measuring properties of the region being mapped; they can show larger portions of the Earth's surface at once; and they are cheaper to produce and transport. These useful traits of maps motivate the development of map projections. However, Carl Friedrich Gauss's Theorema Egregium proved that a sphere's surface cannot be represented on a plane without distortion. The same applies to other reference surfaces used as models for the Earth, such as oblate spheroids, ellipsoids and geoids. Since any map projection is a representation of one of those surfaces on a plane, all map projections distort. Every distinct map projection distorts in a distinct way. The study of map projections is the characterization of these distortions. Projection is not limited to perspective projections, such as those resulting from casting a shadow on a screen, or the rectilinear image produced by a pinhole camera on a flat film plate. Rather, any mathematical function transforming coordinates from the curved surface to the plane is a projection. Few projections in actual use are perspective. For simplicity, most of this article assumes that the surface to be mapped is that of a sphere. In reality, the Earth and other large celestial bodies are generally better modeled as oblate spheroids, whereas small objects such as asteroids often have irregular shapes. Io is better modeled by triaxial ellipsoid or prolated spheroid with small eccentricities. Haumea's shape is a Jacobi ellipsoid, with its major axis twice as long as its minor and with its middle axis one and half times as long as its minor. These other surfaces can be mapped as well. Therefore, more generally, a map projection is any method of "flattening" a continuous curved surface onto a plane. An Albers projection shows areas accurately, but distorts shapes. Map projections can be constructed to preserve at least one of these properties, though only in a limited way for most. Each projection preserves, compromises, or approximates basic metric properties in different ways. The purpose of the map determines which projection should form the base for the map. Because many purposes exist for maps, a diversity of projections have been created to suit those purposes. Another consideration in the configuration of a projection is its compatibility with data sets to be used on the map. Data sets are geographic information; their collection depends on the chosen datum (model) of the Earth. Different datums assign slightly different coordinates to the same location, so in large scale maps, such as those from national mapping systems, it is important to match the datum to the projection. The slight differences in coordinate assignation between different datums is not a concern for world maps or other vast territories, where such differences get shrunk to imperceptibility. The classical way of showing the distortion inherent in a projection is to use Tissot's indicatrix. For a given point, using the scale factor h along the meridian, the scale factor k along the parallel, and the angle θ′ between them, Nicolas Tissot described how to construct an ellipse that characterizes the amount and orientation of the components of distortion. :147–149 By spacing the ellipses regularly along the meridians and parallels, the network of indicatrices shows how distortion varies across the map. Selection of a model for the shape of the Earth or planetary body (usually choosing between a sphere or ellipsoid). Because the Earth's actual shape is irregular, information is lost in this step. Transformation of geographic coordinates (longitude and latitude) to Cartesian (x,y) or polar plane coordinates. In large-scale maps, Cartesian coordinates normally have a simple relation to eastings and northings defined as a grid superimposed on the projection. In small-scale maps, eastings and northings are not meaningful, and grids are not superimposed. A Miller cylindrical projection maps the globe onto a cylinder. One way of describing a projection is first to project from the Earth's surface to a developable surface such as a cylinder or cone, and then to unroll the surface into a plane. While the first step inevitably distorts some properties of the globe, the developable surface can then be unfolded without further distortion. This transverse Mercator projection is mathematically the same as a standard Mercator, but oriented around a different axis. Once a choice is made between projecting onto a cylinder, cone, or plane, the aspect of the shape must be specified. The aspect describes how the developable surface is placed relative to the globe: it may be normal (such that the surface's axis of symmetry coincides with the Earth's axis), transverse (at right angles to the Earth's axis) or oblique (any angle in between). The developable surface may also be either tangent or secant to the sphere or ellipsoid. Tangent means the surface touches but does not slice through the globe; secant means the surface does slice through the globe. Moving the developable surface away from contact with the globe never preserves or optimizes metric properties, so that possibility is not discussed further here. Tangent and secant lines (standard lines) are represented undistorted. If these lines are a parallel of latitude, as in conical projections, it is called a standard parallel. The central meridian is the meridian to which the globe is rotated before projecting. The central meridian (usually written λ0) and a parallel of origin (usually written φ0) are often used to define the origin of the map projection. A globe is the only way to represent the earth with constant scale throughout the entire map in all directions. A map cannot achieve that property for any area, no matter how small. It can, however, achieve constant scale along specific lines. The scale depends on location, but not on direction. This is equivalent to preservation of angles, the defining characteristic of a conformal map. Scale is constant along any parallel in the direction of the parallel. This applies for any cylindrical or pseudocylindrical projection in normal aspect. Combination of the above: the scale depends on latitude only, not on longitude or direction. This applies for the Mercator projection in normal aspect. Projection construction is also affected by how the shape of the Earth or planetary body is approximated. In the following section on projection categories, the earth is taken as a sphere in order to simplify the discussion. However, the Earth's actual shape is closer to an oblate ellipsoid. Whether spherical or ellipsoidal, the principles discussed hold without loss of generality. Selecting a model for a shape of the Earth involves choosing between the advantages and disadvantages of a sphere versus an ellipsoid. Spherical models are useful for small-scale maps such as world atlases and globes, since the error at that scale is not usually noticeable or important enough to justify using the more complicated ellipsoid. The ellipsoidal model is commonly used to construct topographic maps and for other large- and medium-scale maps that need to accurately depict the land surface. Auxiliary latitudes are often employed in projecting the ellipsoid. A third model is the geoid, a more complex and accurate representation of Earth's shape coincident with what mean sea level would be if there were no winds, tides, or land. Compared to the best fitting ellipsoid, a geoidal model would change the characterization of important properties such as distance, conformality and equivalence. Therefore, in geoidal projections that preserve such properties, the mapped graticule would deviate from a mapped ellipsoid's graticule. Normally the geoid is not used as an Earth model for projections, however, because Earth's shape is very regular, with the undulation of the geoid amounting to less than 100 m from the ellipsoidal model out of the 6.3 million m Earth radius. For irregular planetary bodies such as asteroids, however, sometimes models analogous to the geoid are used to project maps from. A fundamental projection classification is based on the type of projection surface onto which the globe is conceptually projected. The projections are described in terms of placing a gigantic surface in contact with the earth, followed by an implied scaling operation. These surfaces are cylindrical (e.g. Mercator), conic (e.g. Albers), and plane (e.g. stereographic). Many mathematical projections, however, do not neatly fit into any of these three conceptual projection methods. Hence other peer categories have been described in the literature, such as pseudoconic, pseudocylindrical, pseudoazimuthal, retroazimuthal, and polyconic. Because the sphere is not a developable surface, it is impossible to construct a map projection that is both equal-area and conformal. No reference has been made in the above definitions to cylinders, cones or planes. The projections are termed cylindric or conic because they can be regarded as developed on a cylinder or a cone, as the case may be, but it is as well to dispense with picturing cylinders and cones, since they have given rise to much misunderstanding. Particularly is this so with regard to the conic projections with two standard parallels: they may be regarded as developed on cones, but they are cones which bear no simple relationship to the sphere. In reality, cylinders and cones provide us with convenient descriptive terms, but little else. Has parallels constrained to where they fall when light shines through the globe onto the cylinder, with the light source someplace along the line formed by the intersection of the prime meridian with the equator, and the center of the sphere. Where the light source emanates along the line described in this last constraint is what yields the differences between the various "natural" cylindrical projections. But the term cylindrical as used in the field of map projections relaxes the last constraint entirely. Instead the parallels can be placed according to any algorithm the designer has decided suits the needs of the map. 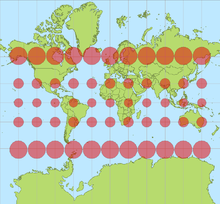 The famous Mercator projection is one in which the placement of parallels does not arise by "projection"; instead parallels are placed how they need to be in order to satisfy the property that a course of constant bearing is always plotted as a straight line. The Mercator projection shows rhumbs as straight lines. A rhumb is a course of constant bearing. Bearing is the compass direction of movement. A "normal cylindrical projection" is any projection in which meridians are mapped to equally spaced vertical lines and circles of latitude (parallels) are mapped to horizontal lines. The mapping of meridians to vertical lines can be visualized by imagining a cylinder whose axis coincides with the Earth's axis of rotation. This cylinder is wrapped around the Earth, projected onto, and then unrolled. North-south stretching equals east-west stretching (sec φ): The east-west scale matches the north-south scale: conformal cylindrical or Mercator; this distorts areas excessively in high latitudes (see also transverse Mercator). North-south stretching grows with latitude faster than east-west stretching (sec2 φ): The cylindric perspective (or central cylindrical) projection; unsuitable because distortion is even worse than in the Mercator projection. North-south stretching grows with latitude, but less quickly than the east-west stretching: such as the Miller cylindrical projection (sec 4/5φ). North-south distances neither stretched nor compressed (1): equirectangular projection or "plate carrée". North-south compression equals the cosine of the latitude (the reciprocal of east-west stretching): equal-area cylindrical. This projection has many named specializations differing only in the scaling constant, such as the Gall–Peters or Gall orthographic (undistorted at the 45° parallels), Behrmann (undistorted at the 30° parallels), and Lambert cylindrical equal-area (undistorted at the equator). Since this projection scales north-south distances by the reciprocal of east-west stretching, it preserves area at the expense of shapes. 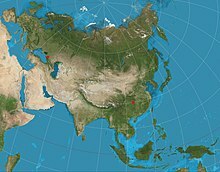 In the first case (Mercator), the east-west scale always equals the north-south scale. In the second case (central cylindrical), the north-south scale exceeds the east-west scale everywhere away from the equator. Each remaining case has a pair of secant lines—a pair of identical latitudes of opposite sign (or else the equator) at which the east-west scale matches the north-south-scale. Normal cylindrical projections map the whole Earth as a finite rectangle, except in the first two cases, where the rectangle stretches infinitely tall while retaining constant width. A sinusoidal projection shows relative sizes accurately, but grossly distorts shapes. Distortion can be reduced by "interrupting" the map. Sinusoidal, which was the first pseudocylindrical projection developed. On the map, as in reality, the length of each parallel is proportional to the cosine of the latitude. The area of any region is true. Collignon projection, which in its most common forms represents each meridian as two straight line segments, one from each pole to the equator. The HEALPix projection combines an equal-area cylindrical projection in equatorial regions with the Collignon projection in polar areas. The term "conic projection" is used to refer to any projection in which meridians are mapped to equally spaced lines radiating out from the apex and circles of latitude (parallels) are mapped to circular arcs centered on the apex. When making a conic map, the map maker arbitrarily picks two standard parallels. Those standard parallels may be visualized as secant lines where the cone intersects the globe—or, if the map maker chooses the same parallel twice, as the tangent line where the cone is tangent to the globe. The resulting conic map has low distortion in scale, shape, and area near those standard parallels. Distances along the parallels to the north of both standard parallels or to the south of both standard parallels are stretched; distances along parallels between the standard parallels are compressed. When a single standard parallel is used, distances along all other parallels are stretched. Equidistant conic, which keeps parallels evenly spaced along the meridians to preserve a constant distance scale along each meridian, typically the same or similar scale as along the standard parallels. Albers conic, which adjusts the north-south distance between non-standard parallels to compensate for the east-west stretching or compression, giving an equal-area map. Lambert conformal conic, which adjusts the north-south distance between non-standard parallels to equal the east-west stretching, giving a conformal map. Bonne, an equal-area projection on which most meridians and parallels appear as curved lines. It has a configurable standard parallel along which there is no distortion. Werner cordiform, upon which distances are correct from one pole, as well as along all parallels. An azimuthal equidistant projection shows distances and directions accurately from the center point, but distorts shapes and sizes elsewhere. Azimuthal projections have the property that directions from a central point are preserved and therefore great circles through the central point are represented by straight lines on the map. These projections also have radial symmetry in the scales and hence in the distortions: map distances from the central point are computed by a function r(d) of the true distance d, independent of the angle; correspondingly, circles with the central point as center are mapped into circles which have as center the central point on the map. The mapping of radial lines can be visualized by imagining a plane tangent to the Earth, with the central point as tangent point. The radial scale is r′(d) and the transverse scale r(d)/(R sin d/R) where R is the radius of the Earth. The gnomonic projection displays great circles as straight lines. Can be constructed by using a point of perspective at the center of the Earth. r(d) = c tan d/R; so that even just a hemisphere is already infinite in extent. The General Perspective projection can be constructed by using a point of perspective outside the earth. Photographs of Earth (such as those from the International Space Station) give this perspective. The orthographic projection maps each point on the earth to the closest point on the plane. Can be constructed from a point of perspective an infinite distance from the tangent point; r(d) = c sin d/R. Can display up to a hemisphere on a finite circle. Photographs of Earth from far enough away, such as the Moon, approximate this perspective. The stereographic projection, which is conformal, can be constructed by using the tangent point's antipode as the point of perspective. r(d) = c tan d/2R; the scale is c/(2R cos2 d/2R). Can display nearly the entire sphere's surface on a finite circle. The sphere's full surface requires an infinite map. Logarithmic azimuthal is constructed so that each point's distance from the center of the map is the logarithm of its distance from the tangent point on the Earth. r(d) = c ln d/d0); locations closer than at a distance equal to the constant d0 are not shown. A stereographic projection is conformal and perspective but not equal area or equidistant. Stereographic: Any circle of a sphere, great and small, maps to a circle or straight line. "Area preserving maps" redirects here. For the mathematical concept, see Measure-preserving dynamical system. Snyder's equal-area polyhedral projection, used for geodesic grids. Two-point equidistant: two "control points" are arbitrarily chosen by the map maker. Distance from any point on the map to each control point is proportional to surface distance on the earth. The Robinson projection was adopted by National Geographic magazine in 1988 but abandoned by them in about 1997 for the Winkel tripel. The mathematics of projection do not permit any particular map projection to be "best" for everything. Something will always be distorted. Thus, many projections exist to serve the many uses of maps and their vast range of scales. Modern national mapping systems typically employ a transverse Mercator or close variant for large-scale maps in order to preserve conformality and low variation in scale over small areas. For smaller-scale maps, such as those spanning continents or the entire world, many projections are in common use according to their fitness for the purpose, such as Winkel tripel, Robinson and Mollweide. Reference maps of the world often appear on compromise projections. Due to distortions inherent in any map of the world, the choice of projection becomes largely one of aesthetics. Thematic maps normally require an equal area projection so that phenomena per unit area are shown in correct proportion. However, representing area ratios correctly necessarily distorts shapes more than many maps that are not equal-area. A controversy in the 1980s over the Peters map motivated the American Cartographic Association (now Cartography and Geographic Information Society) to produce a series of booklets (including Which Map Is Best) designed to educate the public about map projections and distortion in maps. 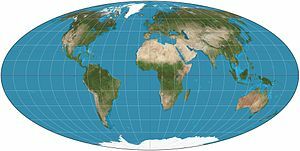 In 1989 and 1990, after some internal debate, seven North American geographic organizations adopted a resolution recommending against using any rectangular projection (including Mercator and Gall–Peters) for reference maps of the world. ^ Snyder, J.P. (1989). Album of Map Projections, United States Geological Survey Professional Paper. United States Government Printing Office. 1453. ^ a b c d Snyder, John P. (1993). Flattening the earth: two thousand years of map projections. University of Chicago Press. ISBN 0-226-76746-9. ^ Snyder. Working Manual, p. 24. ^ Cheng, Y.; Lorre, J. J. (2000). "Equal Area Map Projection for Irregularly Shaped Objects". Cartography and Geographic Information Science. 27 (2): 91. doi:10.1559/152304000783547957. ^ Stooke, P. J. (1998). "Mapping Worlds with Irregular Shapes". The Canadian Geographer. 42: 61. doi:10.1111/j.1541-0064.1998.tb01553.x. ^ Shingareva, K.B. ; Bugaevsky, L.M. ; Nyrtsov, M. (2000). "Mathematical Basis for Non-spherical Celestial Bodies Maps" (PDF). Journal of Geospatial Engineering. 2 (2): 45–50. ^ Nyrtsov, M.V. (August 2003). "The Classification of Projections of Irregularly-shaped Celestial Bodies" (PDF). Proceedings of the 21st International Cartographic Conference (ICC): 1158–1164. ^ Clark, P. E.; Clark, C. S. (2013). "CSNB Mapping Applied to Irregular Bodies". Constant-Scale Natural Boundary Mapping to Reveal Global and Cosmic Processes. SpringerBriefs in Astronomy. p. 71. doi:10.1007/978-1-4614-7762-4_6. ISBN 978-1-4614-7761-7. ^ Snyder, John Parr (1987). Map Projections – a Working Manual. U.S. Government Printing Office. p. 192. ^ Weisstein, Eric W. "Sinusoidal Projection". MathWorld. ^ Carlos A. Furuti. "Conic Projections"
^ Weisstein, Eric W. "Gnomonic Projection". MathWorld. ^ "The Gnomonic Projection". Retrieved November 18, 2005. ^ Weisstein, Eric W. "Orthographic Projection". MathWorld. ^ Weisstein, Eric W. "Stereographic Projection". MathWorld. ^ Weisstein, Eric W. "Azimuthal Equidistant Projection". MathWorld. ^ Weisstein, Eric W. "Lambert Azimuthal Equal-Area Projection". MathWorld. ^ Snyder, John P. "Enlarging the Heart of a Map". Archived from the original on July 2, 2010. Retrieved April 14, 2016. ^ Choosing a World Map. Falls Church, Virginia: American Congress on Surveying and Mapping. 1988. p. 1. ISBN 0-9613459-2-6. ^ Slocum, Terry A.; Robert B. McMaster; Fritz C. Kessler; Hugh H. Howard (2005). Thematic Cartography and Geographic Visualization (2nd ed.). Upper Saddle River, NJ: Pearson Prentice Hall. p. 166. ISBN 0-13-035123-7. ^ Miller, Osborn Maitland (1942). "Notes on Cylindrical World Map Projections". Geographical Review. 32 (3): 424–430. doi:10.2307/210384. ^ Raisz, Erwin Josephus. (1938). General Cartography. New York: McGraw–Hill. 2d ed., 1948. p. 87. ^ Robinson, Arthur Howard. (1960). Elements of Cartography, second edition. New York: John Wiley and Sons. p. 82. ^ American Cartographic Association's Committee on Map Projections, 1986. Which Map is Best p. 12. Falls Church: American Congress on Surveying and Mapping. ^ Robinson, Arthur (1990). "Rectangular World Maps—No!". Professional Geographer. 42 (1): 101–104. doi:10.1111/j.0033-0124.1990.00101.x. ^ "Geographers and Cartographers Urge End to Popular Use of Rectangular Maps". American Cartographer. 16: 222–223. 1989. doi:10.1559/152304089783814089. "An Album of Map Projections" (PDF). (12.6 MB), U.S. Geological Survey Professional Paper 1453, by John P. Snyder (USGS) and Philip M. Voxland (U. Minnesota), 1989. A Cornucopia of Map Projections, a visualization of distortion on a vast array of map projections in a single image. G.Projector, free software can render many projections (NASA GISS). Color images of map projections and distortion (Mapthematics.com). Geometric aspects of mapping: map projection (KartoWeb.itc.nl). Java world map projections, Henry Bottomley (SE16.info). Map projections http://www.3dsoftware.com/Cartography/USGS/MapProjections/ at the Wayback Machine (archived January 4, 2007) (3DSoftware). Map Projections An interactive JAVA applet to study deformations (area, distance and angle) of map projections (UFF.br). Map Projections: How Projections Work (Progonos.com). Map Projections Poster (U.S. Geographical Survey). PROJ.4 – Cartographic Projections Library. Projection Reference Table of examples and properties of all common projections (RadicalCartography.net). "Understanding Map Projections" (PDF). (1.70 MB), Melita Kennedy (Esri). World Map Projections, Stephen Wolfram based on work by Yu-Sung Chang (Wolfram Demonstrations Project).